HomeGuard is the first physical chemical termite barrier in a non-soil matrix that is typically installed under concrete slabs and can replace the moisture membrane. It is a single sheet membrane that is environmentally friendly and user friendly. It is a flexible building product that can be moulded around unusual shapes, quickly cut and joined and offers long-term termite defence. HomeGuard has its active ingredient impregnated within the plastic sheet. Termites that come into contact with HomeGuard will be immediately repelled or even killed, giving you peace of mind that the enemy won’t get through. Can HomeGuard be used on Existing Structures? Yes, New buildings are most suited for installation of HomeGuard, however existing buildings and structures can also benefit. HomeGuard can be installed to areas where other forms of defence cannot be used due to environmental or construction problems. FMC wanted to make their commitment to the Australian homeowner absolute and transparent. Knowing that most general household insurance does not cover subterranean termite damage, they’ve introduced the ultimate subterranean termite secure warranty for Australian homeowners. 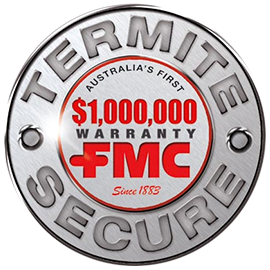 A no-nonsense, simple warranty covering all structural and decorative timbers that are protected by a HomeGuard subterranean termite barrier which has been correctly installed by an FMC trained HomeGuard Accredited Operator.